The Bank of England’s (BOE) upcoming policy meeting could go a long way in providing some positive sentiment in the U.K. economy, long burdened by sluggish growth and Brexit drama, according to analysts. Slightly sunnier forecasts for U.K. growth of late are leading analysts to believe the Bank will send a more hawkish signal from its monetary policy committee (MPC) on Thursday, indicating an interest rate hike in May. The last quarter of 2017 saw a 0.5 percent expansion for the U.K. economy, up from an expected 0.4 percent, boosted by the services sector. 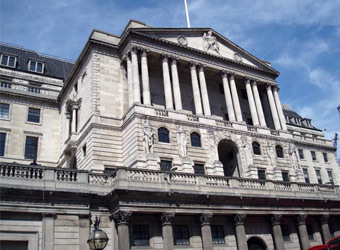 “A stronger growth outlook should encourage the BOE to speed up plans for gradual tightening, having signaled a glacial pace of one hike per year in the coming years,” Lee Hardman, currency analyst at MUFG, said in a research note. Meanwhile, the pound has been enjoying its best pickup since the June 2016 vote to leave the European Union, hitting $1.43 on Friday morning alongside a falling dollar and growing trader confidence that a “hard Brexit” will be avoided. If the flight away from the dollar continues, investors are likely to keep turning to the pound, said Simon Derrick, chief currency strategist at BNY Mellon. Numerous analysts are predicting further strengthening through 2018. BMO Capital Markets recently revised its 12-month forecast for GBP-USD up to $1.52, and Berenberg forecast $1.45 by the end of this year. While a stronger currency is harmful for export competitiveness, for the U.K. this development appears welcome. “Unlike other central banks, the BOE should be welcoming a stronger currency as it aides their efforts to return inflation back towards target,” Hardman said. Many observers have long been calling for a rate rise to help bring inflation closer to the government’s target rate of 2 percent. The U.K. in November suffered its highest inflation in half a decade at 3.1 percent, coming down ever slightly to 3 percent for December, hinting that the squeeze on British living standards may gradually begin easing. In December, the IMF (International Monetary Fund) delivered a grim report card on Britain’s economy, blaming Brexit for the country’s slow growth in comparison to a broadly based global upswing. GDP growth for 2017 was 1.8 percent, the lowest in five years.